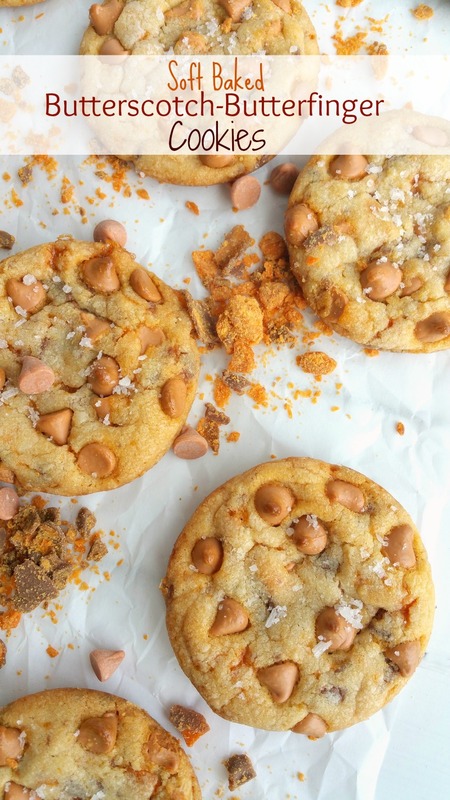 These Soft Baked Butterscotch-Butterfinger Cookies are all you need to satisfy your sweet tooth! 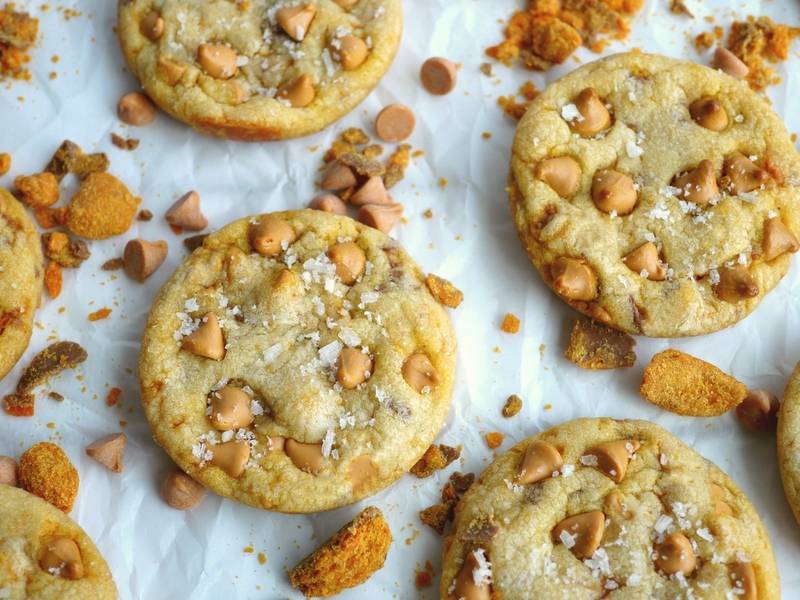 The mixture of butterscotch chips with their brown sugar goodness and the crunchy texture of Butterfinger baking bits is going to rock your cookie jar. How many of you were addicted to butterscotch pudding growing up or maybe you still are? I seriously loved it and still do, however, I feel like I don’t see it as much anymore. Did it fall out of favor? Butterscotch pudding, with a dollop of whipped cream, was always a welcomed treat when I was a kid. I remember it mostly served at diners. 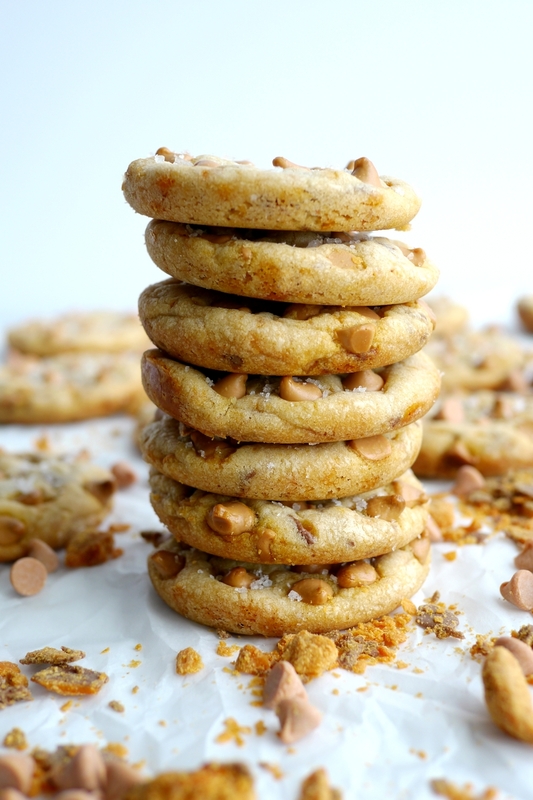 If you combine my devotion to butterscotch, with my love of soft baked cookies, you’ll understand why this recipe is such a hit for me. I guess I also need to mention my obsession with Butterfinger candy bars, or was that already obvious? I pretty much traded away my Halloween candy scores for all the Butterfinger and Reese’s Peanut Butter Cups anyone was willing to give me. If you truly love Butterfingers like me, I highly suggest making these Mini Peanut Butter-Finger Cheesecakes as an added bonus. They are so good! Or maybe Butterfinger Krispie Treats are more up your alley, either way, never underestimate the use of Butterfinger candy in your baked goods! I had someone recently ask me to describe the difference between the taste of butterscotch and caramel. Some might feel they are very similar, however I find them to taste very different. Caramel is made with granulated sugar, milk/cream and butter, while butterscotch is made from brown sugar, milk/cream and lots more butter. Because of the brown sugar, butterscotch has a much more complex flavor overall. Toffee is butterscotch that has been cooked to the hard-crack stage. Have you tried my Butterscotch Bananas? Make it happen soon! Here you can see all the yummy goodness mixed up in your dough. Honestly it takes every bit of will power I have not to eat copious amounts of this dough before it’s baked. Just remember if you partake in the dough your cookie yield is going to be less (not that, that has ever stopped me). If you want your cookies to be perfectly round and uniform in weight, there are two things you are going to have to use. First off, a whoopie pie pan, as seen here, keeps the cookies from spreading out too thin. This means your cookies will not only be perfectly round, but you do not have to spend hours chilling your cookie dough prior to baking. Make sure to have a few of these pans around for ease and never place cookie dough on a hot pan. For uniform sized cookies a baking scale is your best friend. I weigh all my cookie dough balls and find that 36 grams makes the perfect sized cookie for a whoopie pie pan. I add extra baking chips to the outside of my cookie dough balls so they do not bake inside the batter. Cookies are so much prettier this way. Who would not want a stack of these to show up in their lunchbox? Do you see the flecks of Fleur de Sel? While this is optional, it is absolutely imperative if you love the salty-sweet combination of flavors. Fleur de Sel sits at the top of the salt hierarchy, which literally translates as “flower of salt”. It is a hand-harvested, refined sea salt that is celebrated for its textural and mineral complexity. It’s too expensive to be used for anything more than a finishing salt, but is a game changer! The snowflake-like crystals are raked from the surface of a shallow collection of solar-evaporated sea water from the saltier Atlantic coast of west-central France. It’s worth keeping in your pantry to sprinkle on not only dessert, but steaks and pasta upon completion. More than likely you’ll have to have two or three of these cookies due to their addictive taste. The cookies are nice and sturdy, which makes them a great addition to any gathering as they will travel well; think summer barbecues and fall tailgating parties. When I think about all my favorites cookies, it’s hard to just name a few. These Cinnamon Roll Cookies are honestly one of my favorites. And Cherry Chocolate Chip Oatmeal Toffee Cookies have all the ingredients I love. S’mores Pudding Cookies are also another great option for summer barbecues. And if Key Lime Snowball Cookies don’t have your mouth watering?! And Lemon Ricotta Cookies make the perfect party cookie any time of year. Five years ago I shared with you my recipe for Creamy Gnocchi with Walnuts and Fried Sage. I highly suggest giving it a try if you haven’t all ready. Ten years ago I made these Chocolate Malted Muffins and they are still something my kids love to eat. Preheat oven to 350 degrees F. Prepare whoopie pie pans by spraying with cooking spray. Using a stand mixer, cream together shortening, butter and granulated sugar. Add eggs and vanilla and continue to mix until combined. In another bowl, combine flour, baking powder and salt. Add it slowly to the mixing bowl on low speed, mixing until just combined. 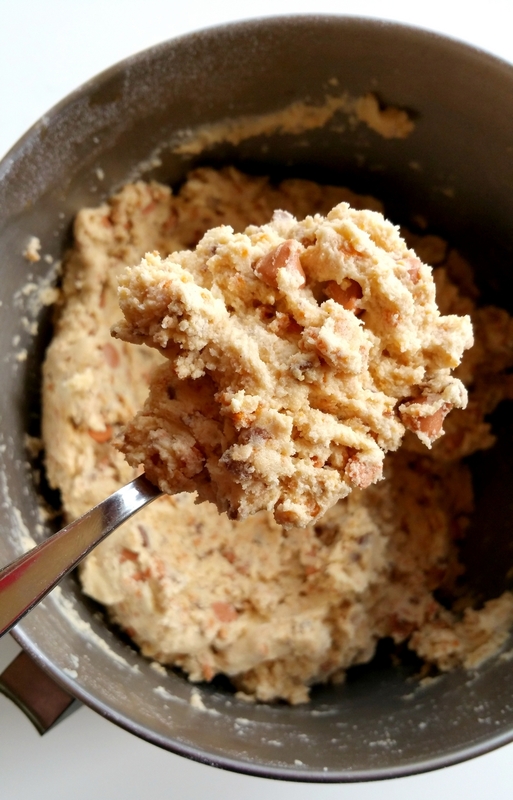 Slowly stir in butterscotch chips and Butterfinger baking chips. Per the above commentary about making the perfect cookie, make cookie balls into balls weighing 36 grams each (about 1-1/2" in size). Place one cookie ball in each well of the prepared whoopie pie pan. 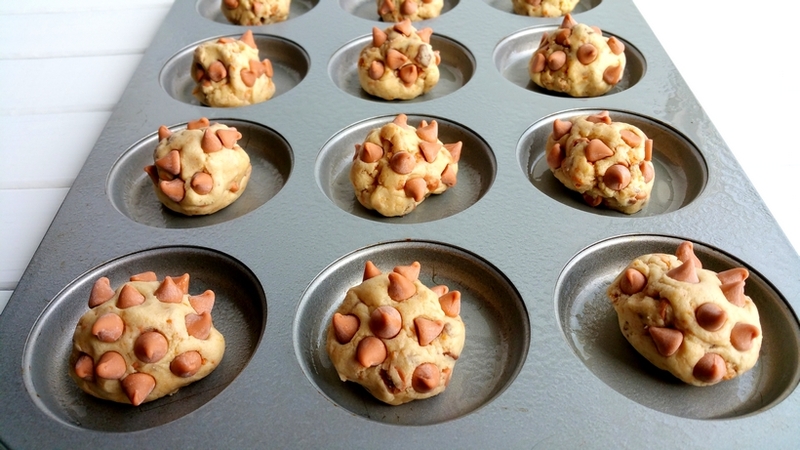 Press on 8 extra butterscotch chips to the outside of each cookie ball. 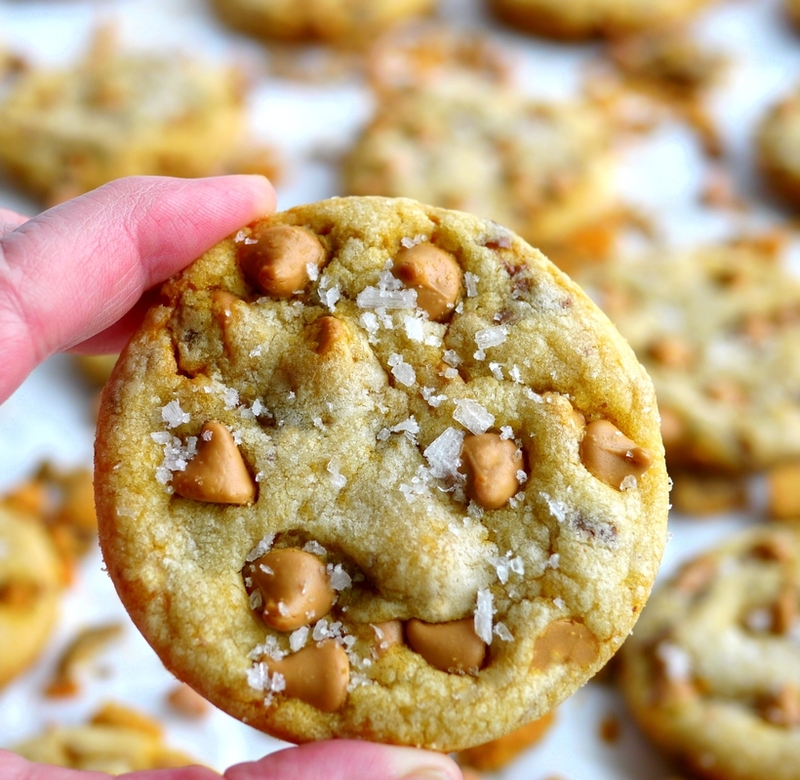 Bake cookies for 12 minutes, remove from the oven and immediately sprinkle with Fleur de Sel. Let them sit 10 minutes in the pan before removing to a cooling rack. Do not try to remove them too soon or they will stick to the bottom. They will continue cooking in the pan and finish nicely. Remove them to a cooling rack. These cookies freeze well. Convection Oven Setting: If using the convection setting on your oven, you can cook three racks of these cookies at once. Preheat oven to 325 degrees and bake for the same amount of time already stated in the recipe. They sound delicious. I have never seen Butterfinger baking chips. Do you have to order online? You can order online, but my regular grocery store carries them. Can these be done as a bar cookie? I think that could possibly work. Genius to use the whoopie pie pan! I have one, next cookie I bake is going into that, recipe has to be killer, I will look for the butterfingers chips locally. Thx! Thank you, I know you will love it. These sound so yummy! I will be making them!